Recovery from the employment losses suffered in the Great Recession (worker’s depression?) of 2007-2009 has been excruciatingly slow. As I write this post in November 2013, total employment in the U.S. is still more than 1% fewer jobs than when we started this mess 5 years and 10 months ago. That’s 976,000 jobs still missing when compared to 6 years ago. 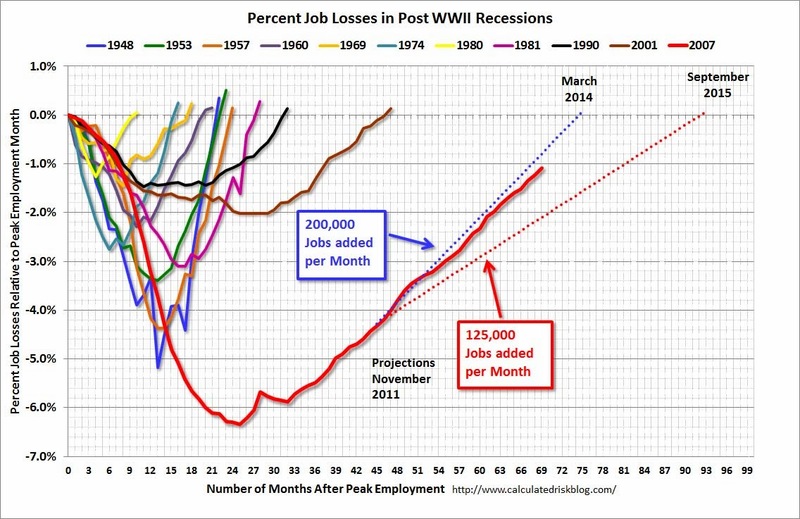 Bill McBride at CalculatedRisk has been tracking this slow recovery of employment and compares it to previous (post-WWII) recessions in this graph. Typically, we recover from a recession and re-gain the lost jobs in two years or less (2001 is the only other exception). There are several reasons why this recovery has been so slow compared to others. The losses were deeper than the others, a financial crisis recovers slower, and households were deeply in debt which slowed recovery in spending. But government policy is one of the most significant causes of the slow recovery. One of the lessons of all those earlier fast-recovery recessions is that counter-cyclical fiscal policy and automatic stabilizers work. Yes, there are technical problems in implementing discretionary fiscal policy such as how big, when to do it, and whether to use tax- vs. spending-based policy changes. But it works -especially when the economy has a lot of slack and the recession is deep and severe. The concept is actually very simple – if consumption spending (C) and investment spending (I) are declining, then the government needs to step in and increase its economic stimulus either by spending more and reducing taxes on those who spend. Another lesson of those earlier recessions is that automatic stabilizers work very, very well. Automatic stabilizers are programs like unemployment compensation, SNAP and welfare assistance, and the progressive income tax system. The problem is that counter-cyclical fiscal policy is largely the responsibility of the national government since only the national government has the freedom to run large deficits when it’s needed. State and local governments are constrained to run balanced budgets every year and they don’t have the sovereign power of the currency like the national government. This requirement of state and local governments to always run balanced budgets means that state and local governments make recessions worse and recoveries slower. Instead of being counter-cyclical, state and local governments are pro-cyclical. Again, Bill McBride of CalculatedRisk helps us visualize how state and local governments helped make the recovery slower. In earlier recessions the national government would step up and offer stimulus to both offset the declines in private spending and private demand, but help fund state and local government to prevent state and local government layoffs. That didn’t happen this time. The national government stimulus was too small for too short of time. What’s worse, the national obsession with the deficit has led to premature austerity policies at the national level. The result was state and local governments, instead of helping the economy recover, were effectively beating the economy for not being more robust. The good news, though, is that state and local governments appear to finally be done beating the economy into submission. State and local austerity is coming to an end according to the data. 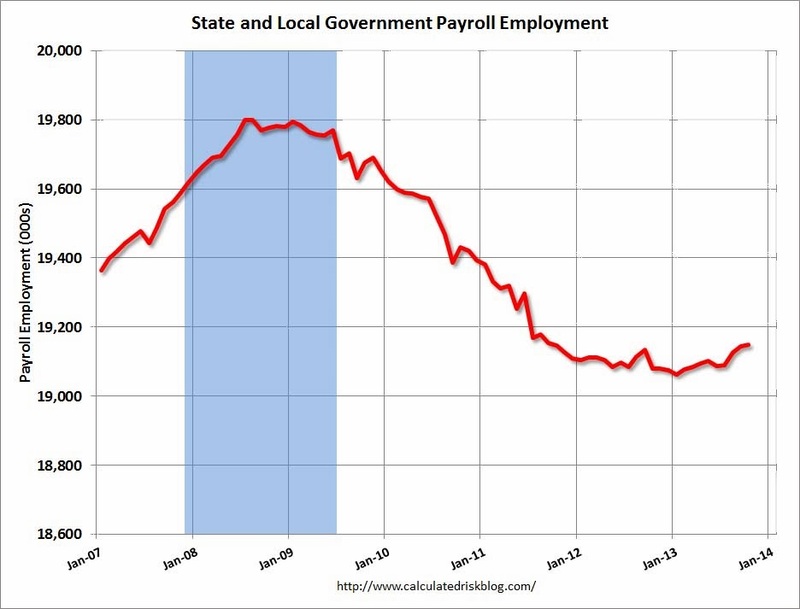 As McBride notes, state and local government employment rose by 74,000 in October 2013. If this continues and state and local governments are starting to hire teachers, firefighters, and police instead of laying them off, then we will likely come closer to finally recovering all the job losses from the recession by spring 2014 instead of spring 2015. Not surprisingly, once the beatings stop, morale actually improves.